A couple of weeks ago I told you I wouldn't be sharing recipes any time soon. Less than an hour later two batches of crackers were coming out of the oven and my entire family was swooning, lost in grain-free crispy cracker bliss. We've made them a couple of times a week ever since. These crackers are easy to make. Delicious to devour. And crazy affordable compared to crackers from the coop or the grocery store. Oh, and healthy. I think I'm supposed to tell you they are healthy. Yes. That, too. Oh, mercy. This could get out of hand. The secret, sweet friends, is tapioca flour. Do you bake with tapioca flour? Along with almond and coconut flour these three are the power triangle of grain-free baking. Tapioca flour, however, is my favorite of the three. It's a little piece of heaven in a Bob's Red Mill bag. Are you ready to have your grain-free, gluten-free cracker-loving mind blown? This time though I think it might have worked. Think shortbread minus the sweet. Tender crisp, crumbly, and rich. I have a vague recollection that this is what a Wheat Thin felt like as it crunched between my teeth. But I might be wrong. It's been a long time. 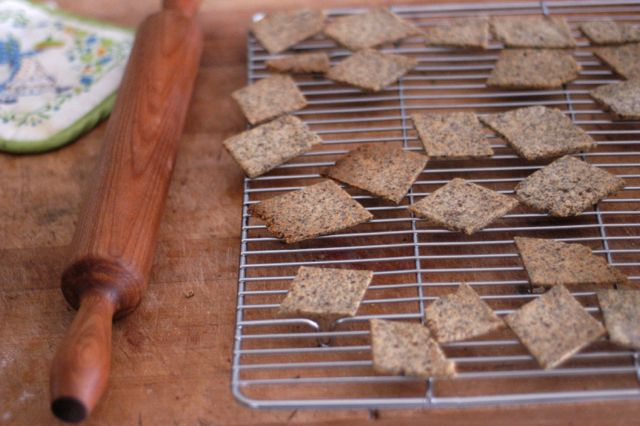 These crackers are crisp and nutty with a tender crumb. So good. If you love sesame you'll lose your mind. Combine all ingredients except water and oil in your food processor. Pulse a few times to combine. Add liquid ingredients and process until thoroughly combine and looking crumbly but most. Turn out onto a sheet of parchment paper and form into a ball. Let rest for five minutes. Flatten out dough and roll out between two sheets of parchment. Cut into cracker shapes with a pizza cutter or knife. Bake for 15 – 20 minutes, remove from oven, and cool on a cooling rack. In the unlikely event that you have leftovers, store them in an airtight container. Be sure to roll them out very thin for a crispy cracker. If you don't they'll be a little gooey in the middle. * I've hidden the leftovers from the third and fourth batch of these I made today from my children. And yes, also from Pete. Combine all ingredients except liquids (water, cream, and oil) in your food processor. Pulse a few times to combine. Open up your food processor and pinch a small handful together in a ball. If it holds together then you're good to go. If it's too dry and crumbles apart add additional water 1 tsp at a time. If it's very wet and sticky add additional tapioca flour 1 tsp at a time. Turn out onto a sheet of parchment paper, form into a ball, and flatten. Roll out very thin (as thinly as you can!) and then cut into cracker shapes with a pizza cutter or knife. Keep your crackers under 2.5" across, otherwise they tend to be sticky in the middle. If your dough is unruly you can roll it out between two sheets of parchment. I don't find it necessary, but just in case. Bake for 20 – 25 minutes, remove from oven, and cool on a cooling rack. I saved the recipes as a PDF here for easier printing. Enjoy! Inspiration for these recipes came from here and here. Great pictures! This looks good!